Paul Couillard has been working as an artist and curator since 1985. Focusing on performance art with forays into theatre, writing, holography, installation, film and video, his work has been presented around the world. His collaborative DUORAMA series with partner Ed Johnson will travel to Regina in January 2002. He is also working on upcoming solo performances for the Contemporary Art Centre in Kyiv (Ukraine), the St. Norbert’s Arts and Cultural Centre (Winnipeg) and the Art Gallery of Hamilton. Paul is the Performance Art Curator for FADO, a Toronto-based, artist-run centre for performance art, and he is a founding curator of the 7a*11d International Performance Art Festival. 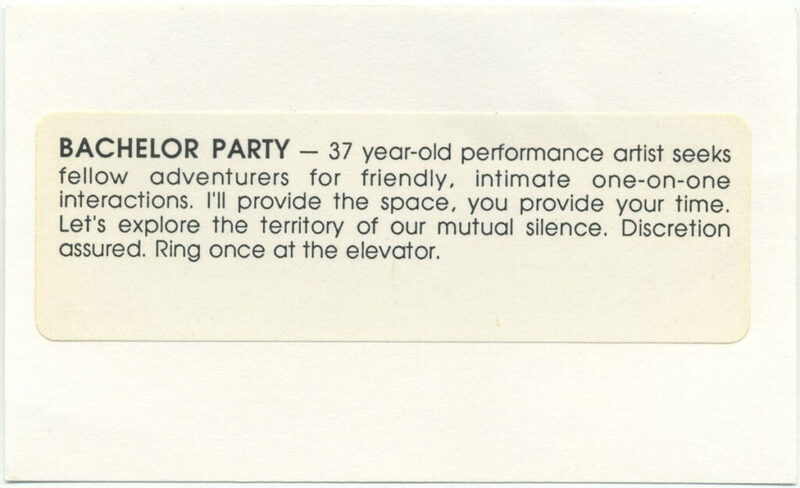 Bachelor Party is a silent one-on-one performance that takes place in a freight elevator. Participants enter a dark, spice-scented elevator and are taken on a ride by their host to various floors, each level corresponding to a different ritual of hospitality. But when the elevator door opens to receive the next guest, only the host remains. Paul Couillard is a multidisciplinary artist working primarily in performance who has been creating and producing work since 1985. His performance work has been featured in various venues in Canada, the US, Japan and Korea, most recently at the Power Plant’s Dwellers at the Threshold and Chicago’s Artemesia Gallery. His 1995 residency project at Symptom Hall, Askance, featured a series of installations and ritual performances based on his involvement with the radical faeries, and he performed a 24-hour piece entitled Encounters for last year’s 7a*11d Festival. He will also be presenting new works in Helsinki, Finland in September. For this 24-hour performance, Couillard invited audience members to join him in a storefront to have an encounter. He socialized with audience members and offered them foot-baths; asking in return that they leave something in the space—either from their pockets, or created on-site, where a Polaroid camera, Walkman, paper, pens and basic art supplies were available. When he was not washing feet, the performer could be found baking bread. All participants were invited to return to the space at the end of the performance, which coincided with the conclusion of the 5-day festival, to break bread together and celebrate the completion of the festival. Paul Couillard‘s current work is concerned with our bodies as vessels of experience. He is interested in the construction of identity within one’s body as a physical place, and how we come to know this and other places through our daily interactions and encounters. His work deals with issues of the self, community and environment.